It was the spring of 1997, and fans of rock’em sock’em hockey were getting all kinds of fired up. The Red Wings were set to face the Flyers in the Stanley Cup finals, and the series’ defining matchup was both brutal and brutally obvious: Detroit’s Vladimir Konstantinov had to be the one to counter Philadelphia’s Eric Lindros. But Red Wings coach Scotty Bowman had his own ideas. Rather than fighting fire with fire, he chose to deprive it of oxygen. And so rather than go with Konstantinov, he opted for Nicklas Lidstrom. The plan worked. Lindros — who was as on top of his game then as he ever would be — played 103 even-strength shifts that series. Lidstrom (along with similarly silky defenseman Larry Murphy) was on the ice for 62 of them. The Detroit defensemen turned out to be the perfect foil. Lidstrom-on-Lindros pitted the ultimate heads-up player against a man whose career was mostly ruined by a tendency to keep his down. Bowman instructed Lidstrom and Murphy to go against the time-honored defensive koan of “play the body, not the puck” and instead drive Lindros crazy not by driving him into oblivion, as other teams had tried to no avail, but with calm poke checks and picked pockets. Which brings us back to 1997. The Legion of Doom could never get the forecheck going that they so relied on because they could never get the freaking puck. It was like a police officer in a cruiser chasing a perp on foot: Sure, the car is bigger, stronger, faster, has greater power … but it can’t turn into a narrow pathway or scale a fence. Lidstrom could do the hockey equivalent of both things, precluding problems with his precision passes — saucer, off the boards, it didn’t matter. He rarely had to get out of jams, because he was rarely ever in one. Lindros scored just once in the series, with 14.8 seconds left in Game 4 and the Flyers’ goalie pulled for an extra skater. Then, 14.8 seconds later, the buzzer sounded and the Red Wings won the Stanley Cup in a sweep. The Red Wings have won three more Stanley Cups since then, in 1998, 2002, and 2008 — that last one with Lidstrom as the captain — making them about as close to a dynastic team as hockey’s had in this post-’80s era of parity. (They also lost in the finals in 1995 and 2009.) What they’ve done might even be more impressive, actually, given the prolonged time span over which they’ve been successful. It’s really hard to be that good for so, so long. Maybe it’s because he’s so low-key. Detroit GM Ken Holland called him “no-maintenance.” He’s been described, variously, as being “the bland leading the blonds” and being “to defensemen what IKEA is to home furnishings: durable, functional, usually about as flamboyant as a desk lamp.” Or maybe it’s just that the player with the best vision in the game wasn’t always obvious to the naked eye. But as Yahoo’s Nick Cotsonika wrote in his lovely good-bye to Lidstrom, who retired Thursday after 20 years in the NHL, even the big names on the Red Wings were no match for the defenseman. Cotsonika (who for years covered the Red Wings for the Detroit Free Press) recalls that during the 2000 All-Star Game, a two-on-one developed: Shanahan and Yzerman on one side, and Lidstrom on the other. Yzerman attempted a saucer pass to Shanahan, and Lidstrom batted it down. Credit his beloved childhood tennis ball drills for that. Ten years before that, Lidstrom had been part of a remarkable Red Wings draft class that also included Sergei Fedorov and Konstantinov, among others. This was back before most teams had well-developed European scouting, and the Red Wings took advantage, getting him in the third round — behind 18 other defensemen — based on the advice of scout Christer Rockstrom. The team was so nervous that other franchises would catch wind of their secret skinny young defenseman before the draft that hockey operations went on total lockdown at any mention of his name. Lidstrom had retained agent Don Meehan, who called Neil Smith, the Detroit chief scout who went on to be the Rangers’ Cup–winning GM, to talk about the player. Smith played dumb, asking Meehan if he meant Doug Lidster, then feigning ignorance of Lidstrom entirely. Meehan pressed. Finally, according to this incredible play-by-play from Michael Farber, the jig was up. The rest is history, etched forever in various lumps of medal: those four Cups and those seven Norris Trophies, one of which he won just last year at the age of 41; the 2002 Conn Smythe; the 1996 2006 Olympic gold. (Lidstrom scored the game-winner in that one.) He won the 1991 World Championships with Team Sweden. He made the NHL All-Star First Team 10 times. In total, he played 1,564 NHL games, scoring 264 goals and adding 878 assists. And that’s just in the regular season: Lidstrom appeared in more playoff games than any other Red Wing. He was an unparalleled gentleman. In a sport where opposing players and fans are impossibly harsh and the media is even worse, there’s no one that has a single bad thing to say about the man. He played with one defensive partner after another over the course of 20 seasons, and nearly all of them found their own games elevated by virtue of vicinity. His slippery technique made him highly durable — he missed only 46 games out of a possible 1,873, including playoffs. At his retirement press conference, he thanked the guy who stocks the water bottles. But he wasn’t just elusive, he was tough. In Game 3 of the 2009 Western Conference finals, a spear to the nuts caused him to miss two games, a first in his career. It turned out that he had suffered “a nearly catastrophic injury to his testicle,” one that required surgery. (I’m glad I’m not a man, or I might not be able to make it through this paragraph.) A week later, he was right back on the ice for all seven games in the Red Wings’ eventual loss to the Penguins for the Cup. He was already chronicled on TV, though, in the NHL 36 series. His episode was a look at the necessary drudgery of professional sports — same meal for every lunch, same tape job on every stick — at which Lidstrom excelled. It’s what helped him remain elite for 20 years, long after so many of his teammates and contemporaries had already reached the end of the line. 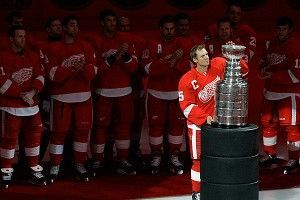 “Retiring today allows me to walk away from the game with pride, rather than have the game walk away from me,” Lidstrom said Thursday at his retirement press conference. It’s hard to imagine the game ever walking away from Lidstrom, though. That’s because in order to do so, the game would have to somehow first wrangle away the puck.